ABU DHABI, 25th July, 2018 (WAM) -- H.H. Sheikh Nahyan bin Zayed Al Nahyan, Chairman of the Board of Trustees of Zayed bin Sultan Al Nahyan Charitable and Humanitarian Foundation and Chairman of the Abu Dhabi Sports Council, and H.H. 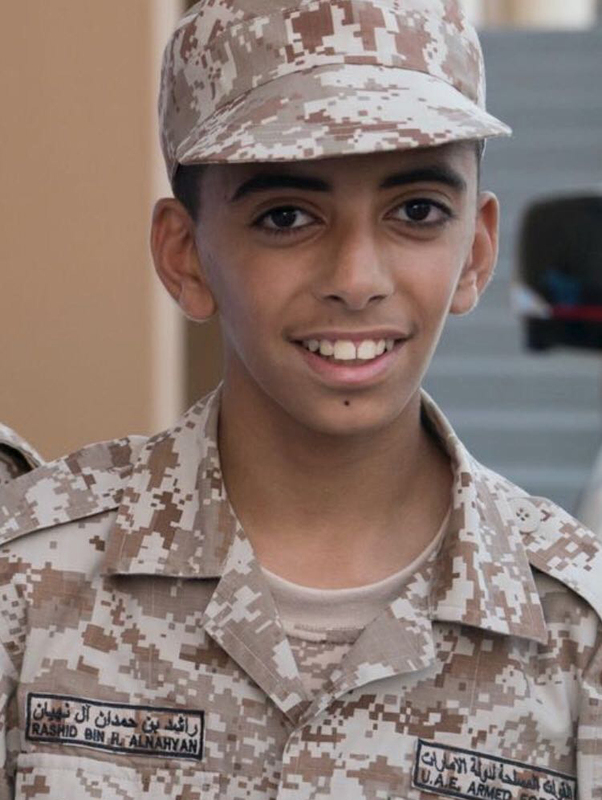 Lt. General Sheikh Saif bin Zayed Al Nahyan, Deputy Prime Minister and Minister of the Interior, have attended the celebration of the General Command of the Armed Forces marking the graduation of the third four-week volunteering course for school students, which was held at the Sieh Al Hama Training Centre in Al Ain and was organised by the National and Reserve Service Authority. The ceremony was attended as well by H.H. Sheikh Theyab bin Mohamed bin Zayed Al Nahyan, Chairman of the Department of Transport of Abu Dhabi; Sheikh Sultan bin Tahnoon Al Nahyan, Member of the Executive Council; Pilot Staff Brigadier Sheikh Ahmed bin Tahnoun bin Mohammed Al Nahyan, Chairman of the National and Reserve Service Authority; Rear Admiral Pilot Staff Major General Sheikh Saeed bin Hamdan bin Mohammed Al Nahyan, Commander of the Naval Forces; and several Sheikhs, Sheikhas, and senior armed forces officers, along with the parents and relatives of the graduates. 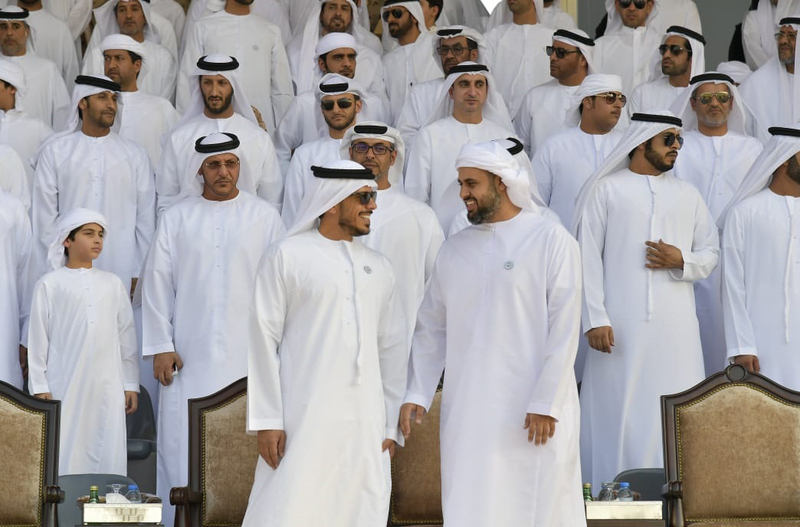 During the celebration, Sheikh Saif stressed the importance of such courses, which have produced honourable examples of the nation’s sons and daughters, instilling in them the love for the homeland. The wise leadership taught them patience and perseverance in order to help them reach their goals and unleash their potential. 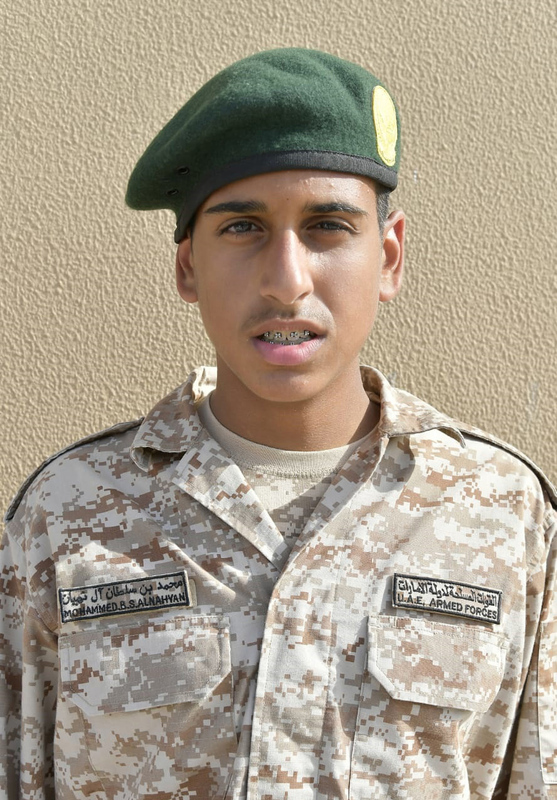 "This contributed to promoting the awareness of Emiratis. The focus has been on the principle of participation and the spirit of loyalty and devotion for the nation and their leaders to continue the victorious journey initiated by the Founding Leader, the late Sheikh Zayed bin Sultan Al Nahyan," he added. 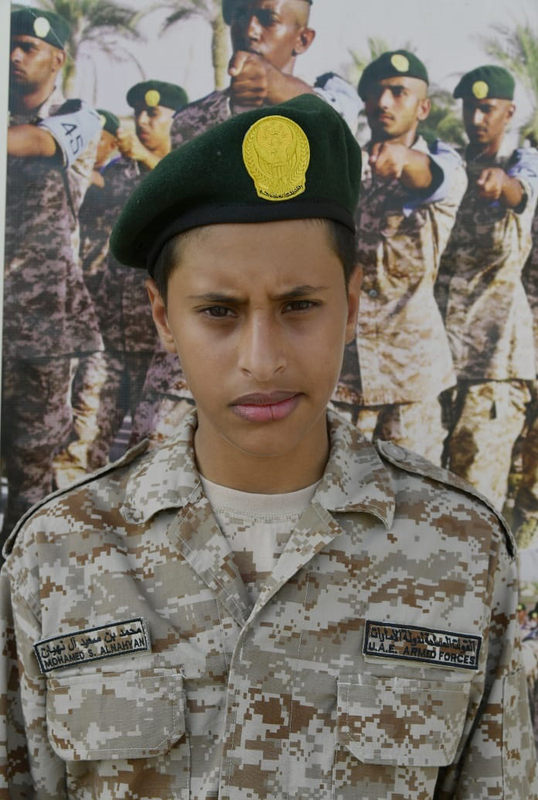 The ceremony began with the national anthem, which was followed by the recital of verses from the Quran. The graduates then marched in front of the main stand in the form of a military parade, to showcase their skills. They then demonstrated how to disassemble and assemble an M16 assault rifle and a machine gun, as well as jiu-jitsu skills, urban warfare and how to clear trenches. The training completed by the students provided them with new knowledge and practical skills, which help them to serve their nation. 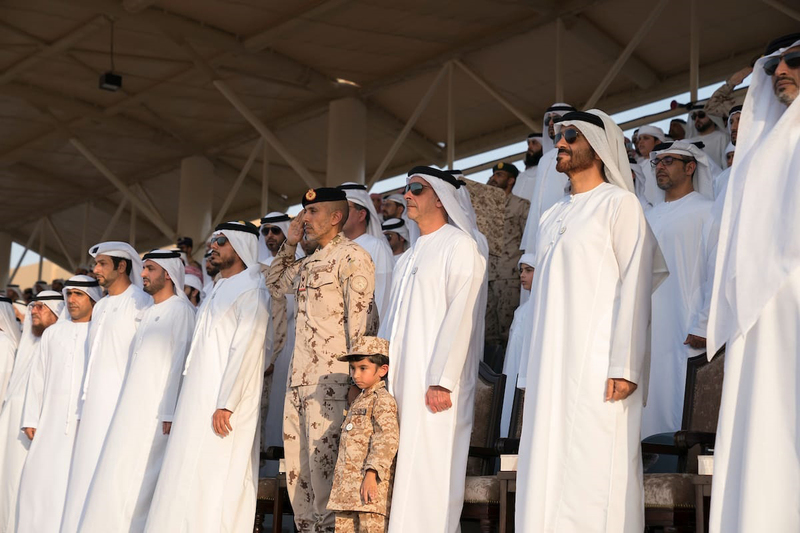 The graduates performed their oath before cheering for President His Highness Sheikh Khalifa bin Zayed Al Nahyan and the Supreme Commander of the UAE Armed Forces. On the occasion, Sheikh Zayed bin Saif bin Zayed Al Nahyan and his brother, Sheikh Khalifa bin Saif bin Zayed Al Nahyan, said that their participation comes with the direct support of their father, H.H. 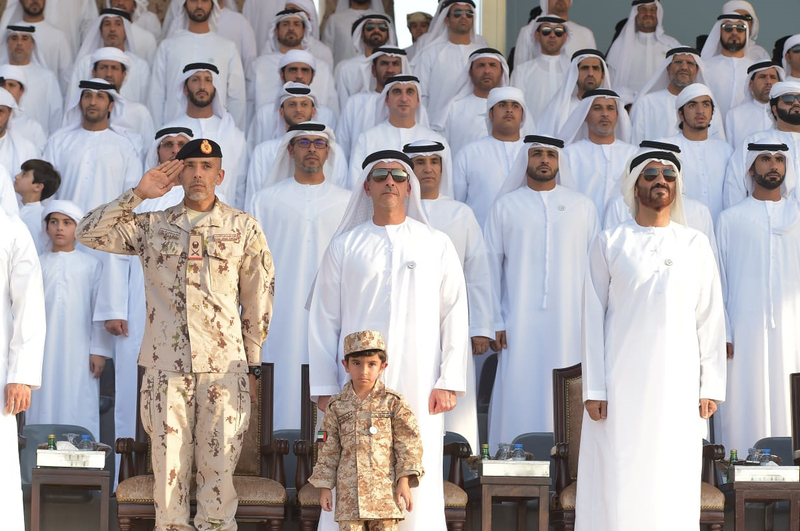 Sheikh Saif bin Zayed Al Nahyan, and his affirmation to them that serving the nation and their wise leadership ensures security and safety for its Emiratis. They expressed their pride and honour in being part of this experience, which helped them discover their talents, and their abilities to face difficulties.